When you symbolically adopt a member of the Vancouver Aquarium and Ocean Wise family, you’re giving a unique gift and supporting the conservation of aquatic life. Give a gift that keeps marine life diverse and flourishing. In addition to feeling good about your gift, you will also receive an applicable tax receipt. NOTE: Canada Post service disruption may cause minor delivery delays. Please email donations@ocean.org for any shipping inquiries. Help support our youngest rescued otter. Virtually adopt Hardy today! Virtually adopt Rialto, the rescued sea otter found alone and sick on a beach in 2016. Recognized by their distinctive deep growl or bark Steller sea lion's numbers have dropped dramatically since 1980. 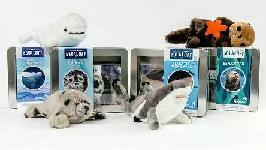 E-adopt to help support this iconic species. Sharks are one of the world's most efficient predators. However, they are under severe threat. Belugas capture the hearts of people young and old and inspire people to learn more about arctic animals and their habitat. Adopt our newest rescued baby otter Hardy! Adopt a seal and help support more than 100 seal pups that are rescued by and rehabilitated at the Marine Mammal Rescue Centre each year! Symbolically adopt Rialto who was found alone on a Washington beach in 2016. Recognized by their distinctive deep growl or bark, Steller sea lion's numbers have dropped dramatically since 1980. Adopt one of the most charismatic animals at the Aquarium. They are playful, cuddly and otterly-adorable. The sharks at the Vancouver Aquarium provide a glimpse into their lives. By symbolically adopting a killer whale you are directly supporting critical research and conservation of wild killer whales.